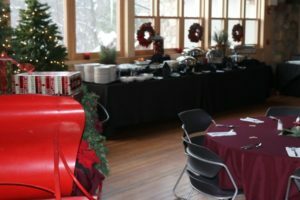 Book your holiday party at Camp Newaygo with Ridge Specialties or let us bring our menu to your event! Camp Newaygo is a beautiful setting for your office event, family get-together, or party with friends. This is even more true during the holiday season as every corner of camp is transformed into a winter wonderland. With three pristine lodges to choose from, we have a space that is the perfect fit for you! With a warm, welcoming space and food thoughtfully prepared by our executive chef, you just have to focus on what the holidays are all about-enjoying time with family and friends. Interested in planning your holiday event with us? We would love to help!